Let me start-off by telling you that I am a Frysian, hailing from the Northern Dutch Province of Friesland. I (and my sister) was “forced” to start sailing at a very young age, because my Dad loved this and wanted to instill this love on us kids. Before I turned 6, I was able to sail around a small A-Jol (predecessor of the Optimist) – meaning I could leave the dock, sail around the little harbor where my Dad had “the Big Yacht” and come back again, all on my own. At age 27, I was living, together with my best friend Martin Buitenhuis, in a beachfront home, right at the edge of Lake Huron in Sarnia, Ontario, Canada. This is one of the deepest lakes in North America; in fact to such an extent, that there is about a 3 Ft. difference High/Low tide ! On this particular day; it was a Sunday, I got up very early in the morning with the plan to go sailing. 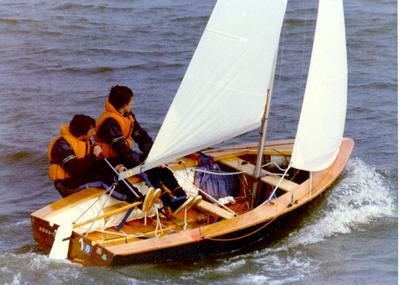 I did not own a boat, but my friend Marten had this small Sailing Dinghy (similar to the one in the picture), which was probably about 15Ft and made of Marine Plywood. 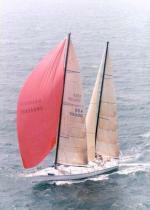 The rigging had a mainsail as well as a reasonable size headsail (jib). My friend was going to spend Easter weekend at Lake Tobermorry so when I asked him if I could use his boat he said; no problem; "You’re one of the most experienced sailors I know". Now; bear in mind that this is Easter-Weekend in Ontario, Canada; the ice had only just recently melted, on this huge lake, but here and there one could still spot ‘glass-like’ slivers of ice floating about. In other words; the temperature of the water was still at an extremely low level. After I had pushed this sailboat into the water, my then current girlfriend also appeared on the beach, because she was going to come with me. So, I put (the only !) life-jacket on her and put her in the boat, just prior to shoving-off. However; at the last possible moment, she jumped out of the boat and sat down on a tree-log on the beach. When I asked her what the problem was, she said something like “I’ll just sit here and look at your sailing skills and then I’ll determine if you know what you’re doing” or words to that effect. I said; "Okay; no problem – I’ll pick you up in no time". With that I pushed-off and started sailing away from the beach. At the time, there was very little wind and the skies were overcast. I do remember how cold it was, though and I was glad that I was wearing jeans, 2 sweaters and a knitted sailing cap. When I was about ½ a mile or so out, I decided to come through the wind to sail back to the beach to pick up Dale. During that maneuver, however, something went a bit wrong and – as is the case in most of these types of accidents, it was a combination of factors, which led to the unfortunate event . . . . .
As my boat came across the wind and the boom changed its position; there was a sudden unexpected gust of wind, and while I moved myself to the high-side, I inadvertently stepped on (and hence trapped) the jib-sheet . . . . . Well; because this was a very light and unstable boat; the darn thing capsized instantly and the last thing I remember is that that big main-sail ‘folded-down’ upon me, as I hit the water. I still vividly remember me falling towards that water and thinking “Oh No; This is going to be Cold!!!" - and it was; unbelievable; the icy cold enveloped me and it was like an electric shock. But my problem was that I was now ‘stuck’ under the main sail and was about to get seriously tangled-up in the rigging; ropes; sheets etc. Without hesitation, I let myself sink down and away from all this ‘debris’ and swam away from the boat and clear of the mast & sails. Then; once surfaced again, I swam back to the un-cluttered side of the boat and wanted to cling-on to the side for dear life . . . . . This was a wooden-boat, without any flotation-devices built into it; which resulted in the capsized boat going completely under-water every time I put any weight on it . . . . This was scary, to say the least. I also realized that, had I worn a life-jacket; I would NOT have been able to dive-down and swim away: which would have cost me my life right there and then. In any event; here I am; trotting to stay afloat, while hanging on to an oar; the helm and some other items I did not want to get lost. One thing many people may not realize: when you sitting in a boat and the weather is calm; you can see the little 1-2 inch “waves” on the surface and you’d never give them a second thought. However, when you’re actually IN that water; you have to make a real effort to be able to see OVER those mini-ripples.. Very soon after the actual capsizing, a thick surface-mist rolled in, out of nowhere and I could not even see the shore anymore; in fact – visibility was reduced to a few feet only. I am shaking uncontrollably from the severe cold and after about 15 minutes I saw a guy in Canadian Canoe paddling by within ‘talking distance’ . . . . . I waved my arms and I screamed at the top of my lungs, but he did not appear to hear, nor see me and after a few seconds, simply disappeared into the thick fog. I was told later, that this would have been a typical hallucination, since this extreme cold does strange things with one’s mind. 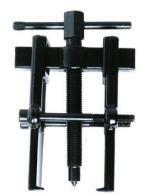 So; I increased my ‘leg-action’ even more, in an effort to keep my circulation going the best way I knew how. Meanwhile, on the beach, my girlfriend had become rather alarmed, since she could not see me anymore; knew that the boat had flipped-over and had ran to our house to call the authorities. However; because if this very dense fog and the fact that there was no way to trace me on any radar, my chances weren’t all that great . . . . . .
After about 35 minutes in that dense fog and that icy water, I remained surprisingly calm, and then I did something I would have never imagined before: I lifted-up my head and stared straight up at the sky and I spoke the following words: “Dear God, IF you are really God and IF you are really there, THIS would be a damned good moment to show it . . . . !” (those were, in fact, my exact words). I had barely finished the words and the next thing I see is this huge and very tall “wall-of-steel” appearing right beside me and I heard this very loud hoot-hoot . . . . This steel wall was the hull of a Coastguard vessel and there were guys looking down from the top of this wall and they saw me down there hanging-on for dear life . . . . They stopped and threw a rope down to me with the words “wrap that around your middle, son !” – Well; I clearly saw the rope, within easy grabbing distance from my person, but I somehow could not move to grab a hold of it . . . . . The guys up top noticed this and then they lowered someone down who landed in the water beside me. He had to ‘un-flinch’ every finger of both my hands, because they were frozen around whatever I was holding onto. Then he put the line around me and the boys hoisted me up to the deck . . . . . I had visions of warm blankets; hot-whiskey toddies and started to feel quite happy about this sudden turn of events . . . . Nothing of the sort happened; they lowered a small aluminum life-boat into the water and then they lowered me into it. Then they lowered one of the Coastguard guys into the same dinghy with me and he told ME to start rowing in ‘that’ direction . . . . . I thought this was grossly unfair, since I was the victim here, but I did as I was told and even-though the rowing was very difficult at first, as we made progress towards the beach, it did become more fluid: I rowed like hell to get to that beach. When I ‘felt’ the sand scouring against the bottom of this dinghy, I knew we had gotten to the beach and I climbed-out only to fall straight into the water (my knees were rubber) and I remember how the feeling of that water was, namely much warmer then before . . . . .
Dale was waiting for me, with an OPP officer, who wanted to ask a lot of difficult questions, but I somehow told him to give me a chance to recover and that I would then come to file my report at the station, that morning. Dale dragged me into our house and I asked her to run the bath, but use NO hot water, only just the cold tap. After she helped me out of my wet clothes, I descended into that cold-water-filled tub an honestly; it was almost too hot for my body. Eventually I sat there and gained the experience of my body “defrosting” slowly . . . . Hypothermia had been very very close to killing me, if it hadn’t been for my “miraculously” being saved ! Hallo my friend, I remember your story! Hi Jaap, The dinghy actually was a Blue Jay. Look at the link. I myself had a similar experience with the same dinghy on the same lake. One late Sunday afternoon I was sailing with my cousin Cees, who was a rather heavily build person and who was not able to move elegantly around the boat. We were klipping along very nicely and enjoyed the tranquility of the late afternoon and the beautiful light of the sunset over the lake. We were just about to return to the beach when all of the sudden the rudder broke. I tried to reassure my cousin, who did not had any saling experience, by telling him not to worry because I would to get the dinghy safely to the beach by using the sails and the paddle. However he panicked and jumped up, slipped and lost his balance. While falling down he managed to get a hold of the boom and as a result he tipped the boat. We were lucky that it was summer and the water was not as cold as during your experience, however the water in these big lakes never gets warm and after approx 20 minutes we were freezing. With not a ship around we were prepared for the worst. Fortunately my constant waving with my peddle, which was freshly varnished, got a ray of sunlite and the reflection was seen by somebody on the beach. This person ran to his house and got his binoculars and noticed my capsized dinghy. I don't believe in coincidences, the law of attraction is my quidance! 15 minutes after he informed the coastguard we were saved by the same people that saved you, for they remembered The little Blue Jay. The moral of my story: Keep your paddle well varnished at all times, it might come in handy one day. Best regards, your alltime friend Marten. I guess it wasn't your time yet Jaap! I know you're not recommending that dinghy sailors shouldn't wear lifejackets or buoyancy aids, but this was one of those few occasions when not wearing one was fortunate indeed - however 99 times out of 100, it would be the other way round. A great story, beautifully told.